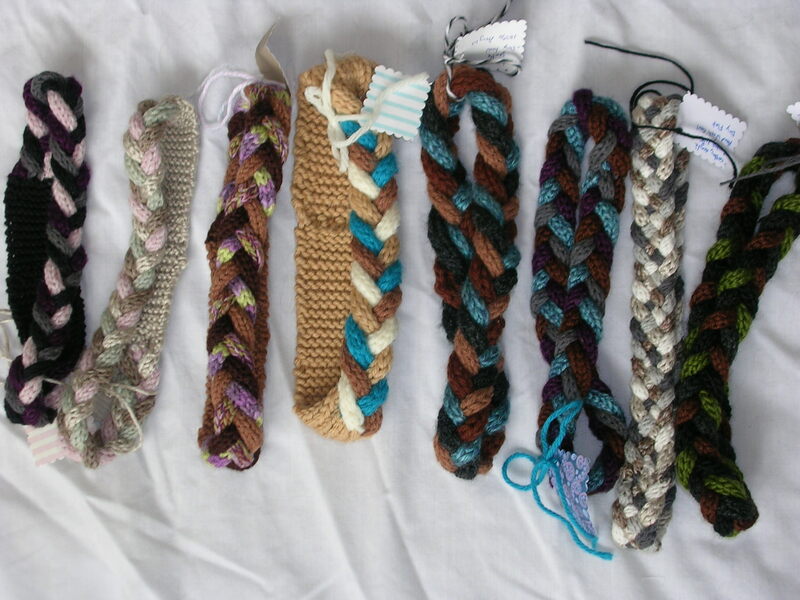 What a great way to use up scraps of yarn. 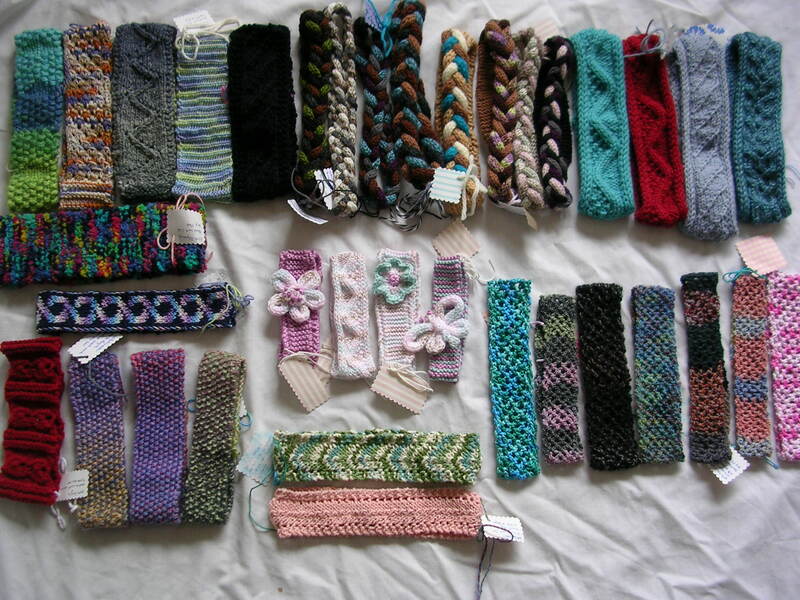 I was such a scrap yarn hording pack rat. 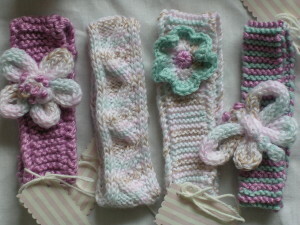 I have made several headbands for myself in the past from waste yarn. 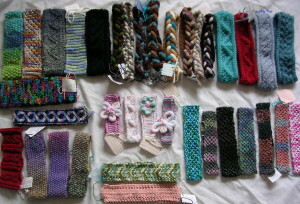 But this was a total head band knitting blitz. It’s for a fund raiser hosted by Friends of Melrose Library, which is where my ‘Off the hook’ knitting & crocheting group meets. 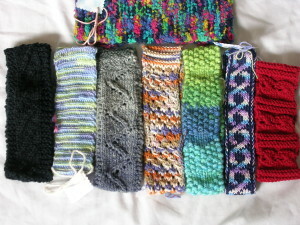 Some of the patterns were were from free patterns found on Ravelry.com My first thought was to do fast and easy. One design which I got there was crocheted and was super fast and stretchy. 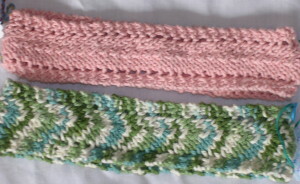 The pattern is called, “Easy Lace Headband”. It a fast, mindless crochet and and it is nice and stretchy with good memory. 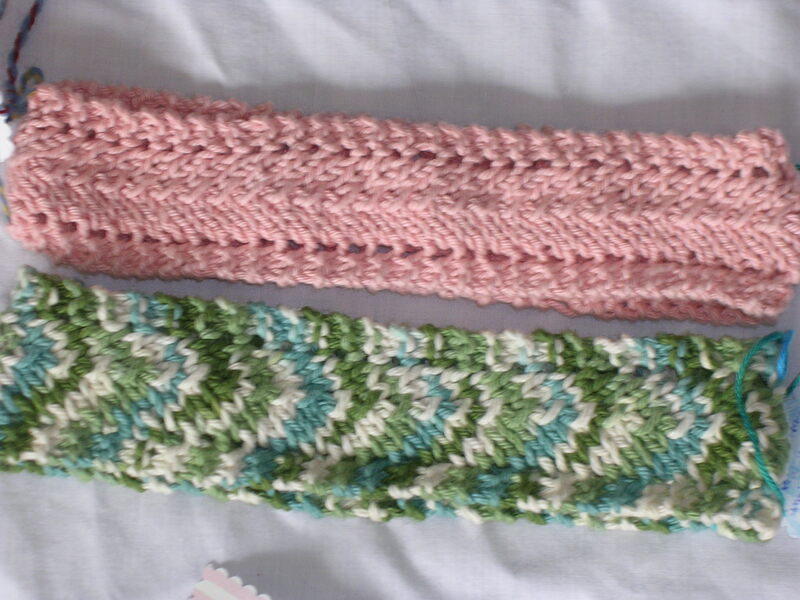 Another free design I tried was this knitted one called “Smidge Headband” Which is a basic knitted lace. It looks great, but isn’t very stretchy. It has to be made to fit someone which is not a great choice for a fundraiser, unless my head is ‘normal’ size? 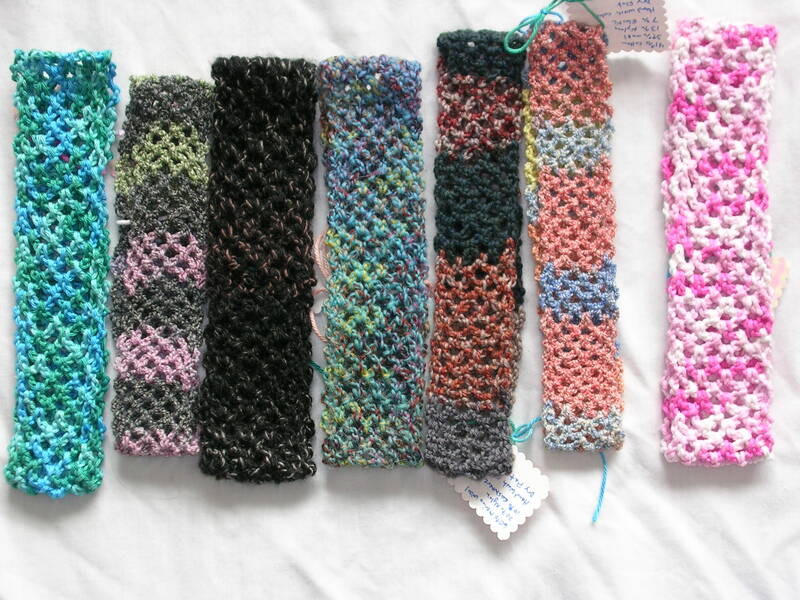 Trying to find a band that would work well with my cotton yarn scraps, I found on Ravelry. A few said it was stretchy and a few said there was something wrong with the pattern and to follow this carlynn field website for the stitch, so I did. It does stretch, but isn’t very elastic, so I added 2″ of garter to the back, which has okay memory in cotton yarn. Next I tried just simple seed stitch which made the most elastic headband, but got boring. 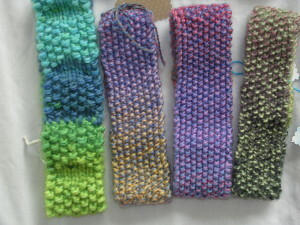 Cast on a odd number of stitches, For all rows, repeat *k, p* to last stitch and k last stitch. It looks nice with these acrylic yarns, which have some sheen. 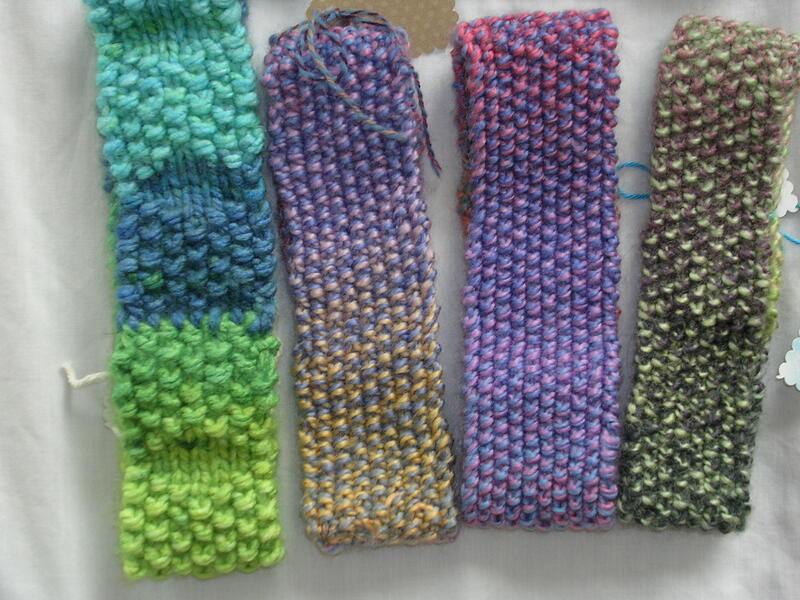 The far left one I added a diamond of stockinette sts every few rows for a change up. So when I brought this first batch to my knitting group we shared our experiences and one person had really out done themselves with elaborate cabled head warmer headbands. So I decided to try new stitches and incorporate them into headband designs I experimented with all sorts of stitches from on stitch dictionary websites. I after a few attempts, I didn’t like the garter stitch edges since it tended to curl under, so I tried I-cord edges, which look cool and are elastic , but don’t have much stretch. 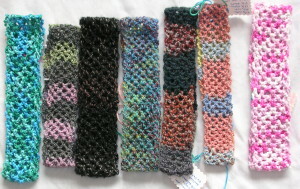 The I-cord edge pops best next to 1 or 2 purl stitch, so I looked for 6-8 stitch patterns that off set well with purl stitches. Later I made the zig zag pattern in baby size. Which is cute, but simple garter or garter with a eyelet edge have a nicer soft stretch and are better for a baby. To make a ‘Garter with eyelet edge’: CO 8 to 15 stitches. Every row: k1, yo, k2tog, k rest of the row. My own brain child was to garter stitch the back band 8 sts for ~2″ increase every other row to 12 sts, then take 4 sts off at a time to a dpn and make I-cord, when each I-cord was about 13-15″ long, braid and then connect pull out i-cord stitches until they were all even and reconnect to a straight needle, garter 12, and then decrease every other row to 8 sts, than garter for 2″. 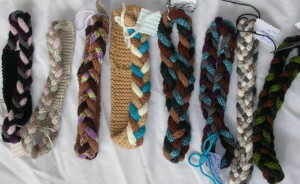 After 2 headbands of hand knit I-cord I decided to buy a little i-cord machine, which was faster, but tying in all the ends got tiring. 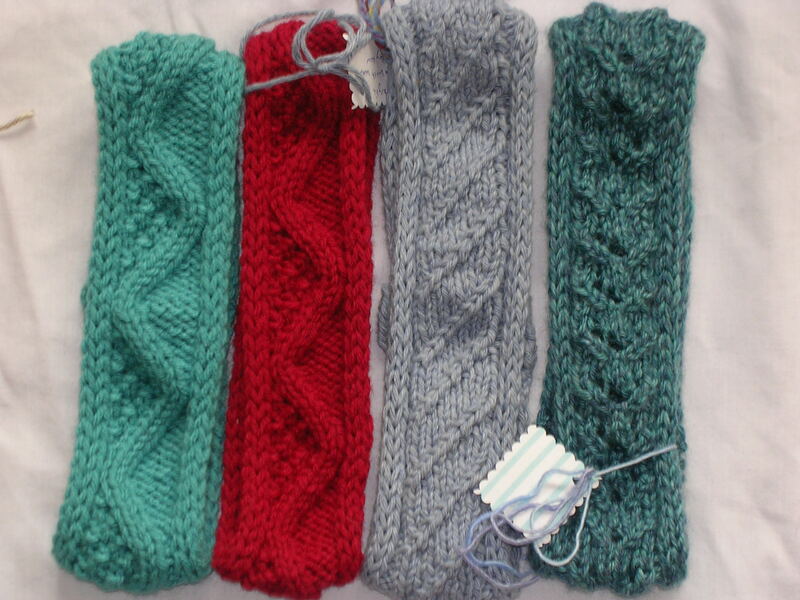 They have good stretch & memory, but are a little bulky, so for myself, a flatter garter stitch at the back of neck. And this was a double knit take off from my Claddagh potholder pattern. 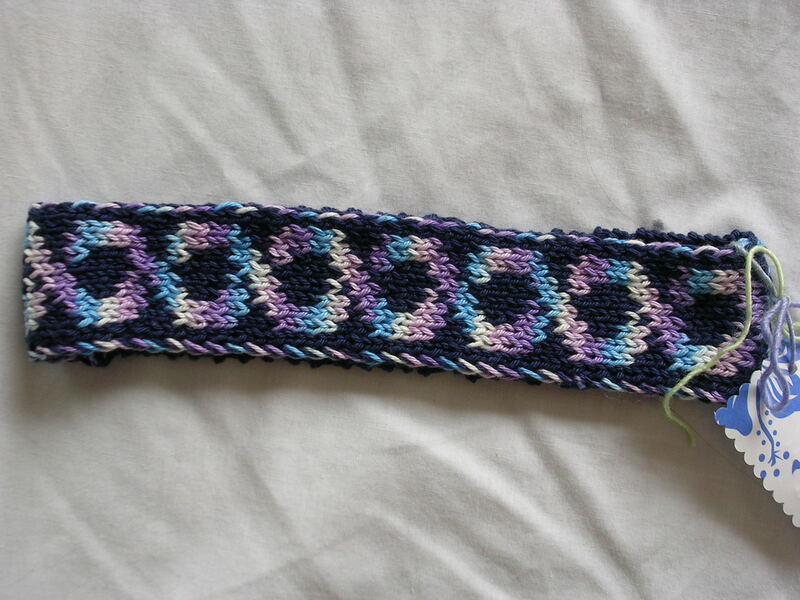 I had this on needles forever, and had just put aside since while it is lovely, it’s a tad to bold for me to wear. I added a seed stitch backer to finish it off and give it better stretch.